December 16, 2016—Village of Hoosick Falls officials, Saint-Gobain Performance Plastics and Honeywell International are in the process of finalizing an agreement whereby the Village has sought reimbursement from the companies for costs it has incurred related to the PFOA water crisis. The agreement calls for the payment of $850,000 to cover, among other items, water monitoring and analysis, flushing Village water lines and associated repairs of several hydrants, losses the Village incurred from reduced water and sewer usage, and engineering, legal and public relations consulting fees. The reimbursement supplements prior financial commitments the Village obtained from Saint-Gobain and Honeywell to fund temporary and full capacity carbon treatment systems at the Village water treatment plant, installation of water treatment systems at several locations in the Village, and the provision of bottled water. These commitments are embodied in a Consent Order the companies signed with New York State earlier this year. "This agreement, along with New York State's Consent Order, will ensure that Village residents are not forced to bear the financial burden of paying for the Village's response to the PFOA crisis — a situation they did not create," said Village Mayor David Borge. "This is a substantial reimbursement that will significantly replenish the Village coffers, ensure we continue to provide critical services for Village residents, and protect the Village in the future." In addition to the reimbursement of funds, the agreement provides for a reservation of rights by the Village for future potential liabilities related to PFOA releases associated with the companies' former manufacturing facilities in the Village. PFOA contamination that may have resulted from other locations, such as the Village-owned landfill, are not covered by the new agreement. Attorneys representing the Village Board reviewed the major provisions of the agreement with the Village Board at a meeting earlier this week. Village board members considered voting on a resolution to authorize the Mayor to sign the agreement once it was finalized, but chose to wait until the final agreement was prepared and available for public review. A special meeting of the Village Board has been tentatively scheduled for Dec. 28, should the agreement be finalized before the end of the year. US EPA; "Results from 34 Locations Show No Soil Cleanup Needed at Residential Properties, Football & Recreational Fields"
September 26, 2016—As part of its on-going work in Hoosick Falls, NY, in May 2016, the U.S. Environmental Protection Agency (EPA) sampled soil at a number of residential properties near the Saint-Gobain McCaffrey Street facility to determine if soil in the area has been impacted by past operations at the facility. Soil samples were also collected from the swampy, wooded area southeast of the McCaffrey Street facility, and the football field and picnic area at the end of Waterworks Road. Based on an assessment of data collected to date, PFOA levels found in soil do not necessitate any additional sampling or cleanup work in any of the areas sampled at this time. Read the full EPA update. September 9, 2016— The U.S. Environmental Protection Agency has proposed adding the Saint-Gobain Performance Plastics site in the Village of Hoosick Falls, N.Y. to its Superfund National Priorities List (NPL) of the country's most hazardous waste sites. Groundwater at the Saint-Gobain Performance Plastics facility, located at 14 McCaffrey Street, is contaminated with Perfluorooctanoic Acid (PFOA) and Trichloroethylene. Groundwater supplying the village’s public water supply wells is contaminated with PFOA, as well as Vinyl Chloride and 1,2-Dichloroethane (1,2-DCA). The Vinyl Chloride and 1,2-DCA are both below EPA drinking water standards. PFOA does not break down easily and therefore is very persistent in the environment. Its toxicity and persistence in the environment can pose adverse effects to human health and the environment. The Village of Hoosick Falls has added carbon filtration to its public water supply, thereby providing clean water to local residents. The McCaffrey Street facility was built in 1961, and had been used to manufacture circuit board laminates, polytetrafluoroethylene (PTFE)-coated fiberglass and other PTFE products. In 1999, Saint-Gobain Performance Plastics purchased the facility and began operations there, using PFOA in its manufacturing process. PFOA belongs to a group of chemicals used to make household and commercial products that resist heat and chemical reactions and repel oil, stains, grease and water. PFOA was widely used in non-stick pots and pans, stain-resistant carpets, and water-resistant outerwear. In 2006, the EPA reached a nationwide agreement with eight manufacturers to phase out the production and use of PFOA. These manufacturers stopped using PFOA in 2015. In January 2016, the New York State Department of Environmental Conservation added the Saint-Gobain site to the state’s Superfund list and nominated the site for inclusion in the federal Superfund list. In April 2016, the EPA installed groundwater monitoring wells near the Saint-Gobain Performance Plastics facility. In early May 2016, the EPA conducted groundwater sampling at and around the Saint-Gobain Performance Plastics facility. In mid-May, the EPA conducted drinking water sampling at drinking water wells used by the Village of Hoosick Falls. After testing in Hoosick Falls, the EPA determined that inclusion in the federal Superfund program was an effective course of action to address the contamination. In addition to the Saint-Gobain Performance Plastics site, the EPA is proposing to add 7 other sites to the National Priorities List today. The EPA typically nominates sites to the National Priorities List twice each year, in the spring and in the fall. For Federal Register notices and supporting documents for these final and proposed sites, visit: http://www.epa.gov/superfund/current-npl-updates-new-proposed-npl-sites-and-new-npl-sites. With the proposal of this site to the NPL, a 60-day comment period will begin during which the EPA solicits public input regarding this action. For instructions on how to submit comments, go to: https://www.epa.gov/superfund/public-comment-process. Docket number for the site: EPA-HQ-OLEM-2016-0434. Follow the online instructions for submitting comments at http://www.regulations.gov. Hand Delivery or Express Mail: Send comments (no facsimiles or tapes) to Docket Coordinator, Headquarters; U.S. Environmental Protection Agency; CERCLA Docket Office; 1301 Constitution Avenue, NW; EPA West, Room 3334, Washington, DC 20004. Such deliveries are only accepted during the Docket's normal hours of operation (8:30 a.m. to 4:30 p.m., Monday through Friday, excluding Federal holidays). September 8, 2016—The NYS Senate Standing Committee on Health held the second of three scheduled hearings on drinking water contamination on September 07, 2016. The event was held at the Legislative Office Building in Albany. Testimony was presented by representatives of involved state agencies, local elected officials, experts in related fields, and citizens involved with and effected by the PFOA contamination in Hoosick and Petersburgh. A video of the event can be found at the New York State Senate website. September 1, 2016—The NYS Senate held the first of three scheduled hearings on drinking water contamination on August 30, 2016. The event was held at the Hoosick Falls Central School. Testimony was presented by representatives of various state agencies, local elected officials, experts in related fields, and citizens involved with and effected by the PFOA contamination in Hoosick and Petersburgh. A video of the event, and documentation of presented testimony can be found at the New York State Senate website. June 4, 2016—Saint-Gobain and Honeywell’s agreements with New York State represent a giant step forward for the greater Hoosick Falls community. More than two months ago, residents were notified that it was safe to drink and cook with treated water from the Village’s municipal supply. But that decision did not close the doors on our PFOA water crisis. We still do not understand how PFOA has contaminated our groundwater, soil and air. The investigation that Saint-Gobain and Honeywell have agreed to conduct will provide that understanding so a comprehensive, thorough cleanup of our community can be performed. We understand that the Consent Orders require the companies to negotiate with the Village for costs related to the presence of PFOA in the municipal water supply. We are actively pursuing that agreement in order to ensure local taxpayers do not bear the costs of a situation they did not create. It is not uncommon for remedial investigations like this to drag on for months, or even years. The Village Board will work closely with officials from the New York State Departments of Environmental Conservation and Health to ensure this study continues moving forward to enable the companies to perform a thorough cleanup as soon as possible. June 3, 2016—New York State announced today that it has reached two agreements with Saint-Gobain and Honeywell whereby the companies will investigate the sources and extent of PFOA contamination at four Honeywell and two Saint-Gobain plants; investigate the feasibility of an alternate water supply; fund the temporary and full capacity GAC water treatment systems; and reimburse the state for costs it incurred to respond and investigate PFOA contamination. The agreements also require the companies to negotiate with the Village for the Village's costs related to PFOA contamination. The state announced it is transferring payment to the Village for rebates to residents for past water bills. May 19, 2016—Based on the latest science, EPA released drinking water health advisories to provide the most up-to-date information on the health risks of PFOA and PFOS. These advisories will help local water systems and state, tribal and local officials take the appropriate steps to address PFOA and PFOS if needed. EPA’s assessment indicates that drinking water with individual or combined concentrations of PFOA and PFOS below 70 parts per trillion is not expected to result in adverse health effects over a lifetime of exposure. These levels reflect a margin of protection, including for the most sensitive populations. For more information, visit the EPA’s Drinking Water Website, or view the PFOA and PFOS health advisories fact sheet. May 5, 2016: This spring the EPA announced that it would be sampling soil, groundwater and storm drains at and near the Saint-Gobain McCaffrey Street facility in support of its evaluation of the facility for inclusion on the EPA’s Superfund list. That sampling is ongoing, with results expected to be included in its report evaluating whether the site qualifies for the Superfund list. The EPA also announced that sampling of some residential properties near the facility would take place. During the week of April 18th, EPA installed several groundwater monitoring wells within ½ mile of the facility. On April 25th, EPA began sampling soil at the McCaffrey Street facility. Sampling at 15 locations was completed on May 4th. Waste water from the McCaffrey Street facility will also be sampled. Groundwater and waste water sampling is expected to be completed around May 20th. As noted in Community Update #4, all results of this investigation are expected to come back by mid-summer 2016. In a separate effort, during the week of May 9th, EPA expects to sample soil at some residential properties along Carey Avenue near the McCaffrey Street facility, as well as the swampy area southeast of the facility and the football field and park areas at the end of Waterworks Road. This will take approximately one week to complete, and results should be available by July 2016. An update discussing the overall findings will be provided to the community. EPA Announces Additional Soil Testing. April 5, 2016: The EPA has announced that it will collect soil samples from approximately one dozen residential properties near the Saint-Gobain McCaffrey Street facility (on Carey Avenue between Waterworks Road and the west end of Carey Avenue) this spring. EPA will contact residents over the next few weeks to request access for the sampling. In addition, EPA will collect samples of soil, groundwater and storm drains from the McCaffrey Street facility. The results are expected several weeks after the sampling is conducted. Read the EPA Fact Sheet on Additional Soil Testing. EPA Declares Little League and Athletic Fields Safe for Play. April 5, 2016: Based on the results of dozens of soil samples collected at the Little League and athletic fields on Waterworks Road and Barton Avenue, the U.S. Environmental Protection Agency has determined there is no need for cleanup work in any of the areas sampled. Levels of PFOA and related compounds ranged from non-detect to 0.021 ppm, as compared with the EPA's action level for PFOA in soil of 15.6 ppm. View the complete Soil Sampling Results Spreadsheet. and the Soil Sampling Maps. March 30, 2016: The New York State Department of Health today announced that repeated testing of the village of Hoosick Falls’ municipal water system shows non detection of Perfluorooctanoic acid (PFOA) and is now safe for all uses including drinking and cooking. In a letter to Mayor David Borge, Dr. Howard Zucker today informed the Village that the temporary filtration system effectively removes PFOA from the village drinking water and the “no-drink” advisory has been lifted. The village’s temporary municipal filtration system consists of two granular activated carbon filters. Water passes through both filters before entering the village distribution system. Water is sampled after it runs through the first filter, and again after it passes through the second filter. Samples taken after strictly passing through just the first filter show non-detectable levels of PFOA. This non-detect PFOA status has been in place since Sunday, March 13, 2016. The village distribution system is split into six zones that together have more than 82 miles of piping that run to more than 1,400 customers. Since the installation of the carbon filtration system, DOH has been working with residents and the Village to flush the entire distribution system to remove PFOA and has continuously taken water samples from each zone to measure progress. Testing shows that every zone on the village distribution system has non-detectable levels of PFOA. The state is working with the village of Hoosick Falls to notify residents. Residents with questions or concerns can call the Hoosick Falls water hotline at 1-800-801-8092 to speak with a DOH representative. To view the letter from Dr. Zucker officially lifting the state’s health advisory, please click here. Basil Seggos, Acting Commissioner of the New York State Department of Environmental Conservation, said, "Today marks a significant milestone in the state's efforts to address the water contamination in the Hoosick Falls area. DEC continues to install and sample water filtration systems on private wells and expects to provide clearance to homeowners to use the first systems for drinking and cooking this week." Additionally, Dr. Zucker thanked local officials for their partnership in the testing process, including David Borge, Mayor of Hoosick Falls; Mark Surdam, Town of Hoosick Supervisor; Jim Hurlburt, Water Superintendent; Josh Magisano from the Hoosick Falls Water Department; and Aelish Nealon, Executive Director of the HAYC3 Armory. Dr. Zucker also thanked all of the Hoosick Falls residents who allowed DOH to test water in their homes. Establishing a local command center with nearly 100 full-time state officials. The state has also identified Saint-Gobain Performance Plastics and Honeywell International as parties responsible for the PFOA contamination in the village of Hoosick Falls and the town of Hoosick, and is holding the firms accountable for the costs of providing safe drinking water to residents and remediating the contamination. March 23, 2016: According to the New York State Department of Health, the new filtration system installed at the municipal water treatment plant is "functioning properly" and removing PFOA to non-detectable levels (which is defined to be less than 2 parts per trillion). Most recently, NYSDOH collected 7 samples from the new system and all resulted in non-detect levels of PFOA. Ten additional samples were collected by NYSDOH throughout the distribution system. Seven showed non-detectable levels of PFOA while three samples showed levels below 5 ppt. The sample results will be posted on the Village website when a report is received from NYSDOH. EPA's recommendation that residents refrain from using municipal water for drinking or cooking remains in effect. March 18, 2016: On Monday, 3/21 demolition will start on the American House. The demo is expected to take up to 10 days to be completed. Elm Street will be closed on Monday, March 21st but should be open from Tuesday going forward. It will be necessary for the contractor to be spraying the area with water constantly to keep dust under control. As a result of the line clearing, the natural turnover of water in everyday use, and the fact that all water going through the Water Treatment Plant is going through the GAC filter, this water is considered non-detect regarding PFOA. This means that the ground around the demolition area is not expected to be contaminated by it. DEC will have a presence at the demolition site. March 14, 2016: Governor Andrew Cuomo announced test results from the newly installed carbon filtration system at the municipal water treatment plant show that PFOA has been removed to "non-detectable levels." NYSDOH continues to test water samples throughout the Village to assess the ability of the installed carbon filters to effectively reduce PFOA. As NYSDOH continues its comprehensive sampling program, residents are advised to continue using bottled water for drinking and cooking. Governor Cuomo also announced: (1) an agreement with Saint-Gobain and Honeywell to deliver bottled water directly to residents who need assistance; (2) approval of a $150,000 grant to boost capacity of one municipal supply well that has a history of low levels of PFOA; and, (3) results of the latest water samples collected from private wells predominantly located in the Town of Hoosick. Read the Governor's full press release. March 14, 2016: Last week, Village officials initiated a discussion with residents at the monthly board meeting regarding provision of a credit or rebate to residents on their water bills. Village officials subsequently brought these concerns to New York State officials. As a result, Governor Cuomo announced that Hoosick Falls residents will receive a rebate covering six months of water payments, a total of approximately $240,000. New York State intends to seek reimbursement for the costs of the rebate program from Saint-Gobain and Honeywell. The process by which residents will receive their rebates are being developed now. Residents are advised to continue to use bottled water until otherwise notified. March 9, 2016: Flushing of Village water mains and storage tanks has now been completed. Residents who have not yet flushed their residential plumbing are encouraged to do so. In the meantime, EPA's recommendation that residents refrain from using municipal water for drinking or cooking remains in effect. Officials from NYSDOH will collect several rounds of water samples from the water treatment plant (both before and after passing through the newly-installed carbon filtration system) and from several households connected to the system, to assess the effectiveness of the treatment system. All sample results will be posted on the Village website when they are received by NYSDOH. March 4, 2016: The State Department of Health and the Department of Environmental Conservation announced additional water sample results as they continue to aggressively provide drinking water acceptable for all uses in the Town of Hoosick and Village of Hoosick Falls. Since February 27, DOH has received results of another 153 water samples and 190 water filtration systems have been installed. Additionally, residential flushing continues throughout the Village ahead of schedule with five zones completed with last one to start in the coming days. DEC Acting Commissioner Basil Seggos said, "Under the Governor's direction, all hands are on deck to bring clean drinking water to residents in the Hoosick Falls area. We made significant progress in installation of carbon filtration systems on private wells in the area and will continue to work as quickly as possible to get these systems online." DOH Commissioner Dr. Howard Zucker said, "Flushing of the Village's water mains and distribution system continues and we are making great progress. We have moved quickly, while at the same time taken extra precautions to minimize water pressure losses at homes, and ensure that enough water is available if needed for firefighting." DEC continued installation of point of entry treatment (POET) filtration systems for homes with private wells with a total of 190 installed. Another 40 are scheduled to be installed this weekend. DEC has received 521 requests for POETs, with 240 requests this week, and performed 386 pre-evaluations which are necessary prior to installing the systems. Of those, 225 pre-evaluations were completed this week. Carbon canisters are being pre-flushed at an off-site central location. Empty canisters are initially installed and replaced with pre-flushed carbon canisters. After installation of the complete system, it is checked to ensure proper connections. After the complete system is installed, homeowners must flush their pipes and are provided instructions on how to do so. After installation, DEC will sample the tap water to determine it is acceptable for all uses. Residents are advised to continue drinking bottled water and refrain from drinking and cooking with water from the public system and with POET systems at private homes until DEC or DOH advises that the water is acceptable for all uses. DOH announced results for an additional 153 water test results received since Friday February 26, which include 146 results that were less than the EPA Advisory level of 100 part per trillion (ppt) and seven that have levels of PFOA at or above the EPA Advisory level of 100 ppt. Of the 146 under the EPA Advisory of 100 ppt, 82 have PFOA levels of less than 2 ppt (i.e. non detection of PFOA) and 64 have levels between 2 and 100 ppt. DOH has also taken an additional 196 water samples since last Saturday. Most of the Village's water delivery system has been successfully flushed. With the installation of the temporary water filtration system, the Village's water mains and distribution system will now be flushed with clean, filtered water, to remove residual PFOA. During the flushing process, residents may notice lower water pressure, and tap water may be cloudier than usual. These are common to the flushing process and are not cause for concern. Until the water distribution system has been flushed and retested, residents should continue to use bottled water or in-home filtration. To take extra precautions to ensure the water distribution system is not overwhelmed, the neighborhoods served by the Village water system has been divided into six zones, and the flushing process is being conducted on a zone-by-zone basis, to ensure contaminants are removed and the water system is not overwhelmed. To date, four of the Village's six zones have been successfully flushed. Once the water mains in each zone have been flushed, residents in that zone will be provided with information on flushing out the plumbing in their homes. DEC evaluated the potential impact flushing could have on the Hoosic River and does not anticipate any significant effects. The amount of flush water to be discharged will be greatly diluted by the flow of the river. DEC expects any increase in the PFOA level in the Hoosic River to be negligible. DEC will monitor the PFOA level in the river throughout the course of the flush discharge. The river is not used as a drinking water source. Flushing indoor plumbing systems can be done quickly and simply. However, it is important that residents wait until the water mains and distribution systems in their neighborhood are flushed before they flush their indoor plumbing. Residents of the Village will be notified when the distribution system in their neighborhood will be flushed. Residents will receive written guidance on how to flush their plumbing and when they should do so. It will take about a half hour to flush your home. While the flushing process is taking place, residents may notice discoloration of their water, and may also have issues with water pressure in their homes. This is not a cause for concern, and is normal for any flushing process. Water samples will be routinely taken and monitored - before, during and after the flushing of the system and at various points in the distribution system. Bottled water will continue to be provided at no cost at Tops Friendly Market on Route 22. In addition, it's important to note that there is no need for residents to flush outdoor spigots. If they choose to do so, they should run the water for about one minute, either onto the ground or into a small pail which can then be emptied into a sink in their home. Residents should not drain their swimming pools at this point. DOH and DEC are developing a protocol to properly drain swimming pools, which will be complete in time for the summer swimming season. Door hangers: Door hangers with general information about the flushing program and specific instructions on flushing their indoor plumbing will be distributed door-to-door to the homes of Hoosick Falls Village residents on the public water supply on the day the flushing process begins and will be posted on the NYSDOH website. 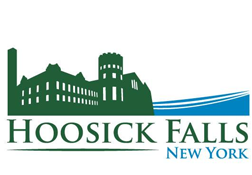 Fact Sheets: Fact sheets describing the process will also be distributed door-to-door to the homes of Hoosick Falls residents, will be available at the informational sessions at the Armory and will also be posted on the NYSDOH website. Residents renting their home or property should consult with the landlord to discuss a flushing plan for the whole building. Staff from both agencies have been holding informational sessions every Tuesday (2 p.m. to 8 p.m.),Thursday (2 p.m. to 8 p.m.), and Saturday (10 a.m. to 2 p.m.), to help residents. Additionally, the Department of Financial Services has set up a Mobile Command Center in Hoosick Falls to assist and provide information to homeowners and residents who may have been impacted by recent mortgage-related events following PFOA contamination in the local water supply. The Mobile Command Center will be set up at HAYC3 Armory located at 80 Church Street in Hoosick Falls during the regularly scheduled DOH and DEC information session on Saturday, March 5 from10 a.m. to 2 p.m.
February 26, 2016: The Hoosick Falls Village Board has received written authorization from the New York State Departments of Environmental Conservation (NYSDEC) and Health (NYSDOH) to begin flushing local water mains and hydrants. Operators of the municipal water supply intend to begin flushing activities this weekend. “Flushing the system will allow clean treated water to flow from our water treatment plant and carbon filtration system into our municipal water distribution system. This will move any residual PFOA-contaminated water in the system to the local sanitary sewer system, where it will be discharged with other water into the Hoosic River,” Village Mayor David Borge said. Flushing activities will proceed by neighborhood, beginning in the south part of the Village and moving north. The process could take approximately two weeks to complete. Updates will be posted on the municipal website regarding the progression of flushing activities. Once the hydrant and water main flushing is completed, NYSDOH will ask residents to flush household pipes by running household taps for a period of time and flushing toilets. NYSDOH intends to conduct a door-to-door program to provide information to residents regarding the specific protocols residents should follow. The NYSDOH information also will be posted on the municipal website as soon as it is received. Separately, in order to determine the ability of the temporary carbon filtration system installed at the water treatment plant to reduce PFOA to safe levels, NYSDOH will collect and analyze several samples of treated water, in addition to samples of tap water from approximately 25 households connected to the municipal water system. A schedule for this sampling program is nearing completion. EPA’s recommendation that residents not drink or cook with water from the municipal water supply remains in effect. Free bottled water will remain available to residents at Tops Market as long as the temporary carbon filtration system is in operation. February 25, 2016: The newly-installed carbon filtration system at the municipal water treatment plant is fully operational and Village officials have begun pumping water through the system and into the Village’s water distribution system, announced Village Mayor David Borge. NYSDOH approved the system for use based on the results of bacteriological and inorganic contaminant sampling. NYSDOH has not yet sampled the treated water to determine if the carbon filtration system is effectively reducing PFOA to safe levels. A schedule for that sampling program is near completion. Mayor Borge thanked the operators of the Village water treatment plant for working tirelessly to get the carbon filtration system installed and operational in a very brief span of time. “Our team worked literally around the clock to install this system as quickly as possible. A project that typically takes months to complete only took a few weeks time. I thank them for their diligence and effort,” Borge said. Village officials will begin flushing the municipal water supply to purge local water mains and hydrants of any PFOA-contaminated water residing in the pipes. Once approval for the flushing procedures is obtained by NYSDOH and NYSDEC, a schedule for flushing activities will be developed and shared with the public. Village Sends Information to Residents re: Water System Flushing. February 25, 2016: The Village Board is mailing postcards to municipal water supply users with information on how the Village will be flushing local water mains and storage tanks throughout the system. These activities will begin this weekend. Additional information regarding household flushing protocols will be distributed by NYSDOH. February 22, 2016: Testing by the New York State Department of Health and the Village of Hoosick Falls, New York, has revealed that groundwater and drinking water in the Village of Hoosick Falls is contaminated with perfluorooctanoic acid (PFOA). The U.S. Environmental Protection Agency (EPA) has been gathering information regarding the Hoosick Falls PFOA contamination in conjunction with the Village of Hoosick Falls, the county health department and the New York State Department of Health (DOH) and Department of Environmental Conservation (DEC). Why is the EPA Sampling Additional Fields? As part of its work to address PFOA in the Village of Hoosick Falls, the EPA sampled the ballfields and park areas along Waterworks Road from February 15 - 19, 2016. The purpose of the sampling was to determine whether past releases of PFOA into the air from local facilities may have contaminated the soil on the fields. Recently, EPA was notified by village officials that the Hoosick Falls Athletic Field near the ice rink and community pool, located approximately 1/4 mile from the Waterworks Road ballfields, may be the main field used by the Town of Hoosick Youth Baseball and Softball league this season. EPA will evaluate the Hoosick Falls Athletic Field, which is used for athletics as well as summer camps and community events. This will include EPA collection of samples from the upper foot of soil. The samples will be analyzed for PFOA and related chemicals, as well as volatile and semi-volatile organic compounds, polychlorinated biphenyls (PCBs), metals and other contaminants. The sampling results will be compared to values that EPA has established to determine if cleanup work is necessary. In Which Areas of the Athletic Field Will Soil be Sampled? The EPA will be sampling multiple locations in and around the Hoosick Falls Athletic Field where people, especially children, are most likely to be exposed to the soil. This includes the playground next to the community pool, several locations on the ballfield and football field area, several locations which may be used as a little league field near the old backstop, areas used by summer camps and the bleachers and spectator areas. The upper foot of soil will be sampled at two intervals: the first three inches, and from three inches to a foot below the surface. The laboratory results are expected to come back in April 2016, along with the results from the Waterworks Road ballfield sampling. All results will be announced and will be available to the public prior to the start of the pre-season for baseball and softball. The EPA plans a public session to explain the results and answer any questions. If hazardous substances, including PFOA or other contaminants, are present in the soil at the ball fields, the EPA will review the results and determine whether any cleanup work is necessary to protect the people who use the ballfields. The EPA, NYSDEC and NYSDOH will be planning and conducting soil, groundwater and surface water sampling in other areas of Hoosick Falls, and will continue to provide updates on the status of the investigation. As the investigation progresses, EPA will also establish an Information Repository at a local library where the public can review and copy records related to EPA’s work in Hoosick Falls. Download a printable version of the EPA press release. February 16, 2016: Governor Andrew M. Cuomo today directed the Department of Financial Services to set up a Mobile Command Center in Hoosick Falls to assist and provide information to homeowners and residents who may have been impacted by recent mortgage-related events following PFOA contamination in the local water supply. The Mobile Command Center will be set up at HAYC3 Armory located at 80 Church Street, Hoosick Falls today, Feb. 16, and tomorrow, Feb. 17 from 2 p.m. to 8 p.m.
DFS staff will be available to provide information and assist homeowners and residents with questions and concerns relating to mortgage loans, or refinancing of loans. DFS staff will also be available to provide information and assist homeowners and residents with questions and concerns relating to insurance issues. Residents of the Hoosick Falls area community are strongly encouraged to attend if they require assistance relating to mortgage loans, refinancing, or insurance issues. Last week, Governor Cuomo announced that the state has begun planning for a possible alternate water supply in the Village of Hoosick Falls – ensuring that the community has a new, permanent supply of clean water. The Governor also announced that the state will purchase and install water filtration systems for approximately 1,500 homes in the Town of Hoosick, if a homeowner wishes to have such a system installed. Furthermore, the state is offering free water sampling tests and free blood testing. More information on all of those actions is available here. The New York State Department of Environmental Conservation has added the Saint-Gobain McCaffrey Street Site to the Registry of Inactive Hazardous Waste Disposal Sites within New York's State Superfund Program. The site has been added to the Registry with the Classification “2”, which signifies that the site presents a significant threat to public health and/or the environment. The public notice provides the reasons for this designation. Perfluorooctanoic acid (PFOA) has been detected at elev ated levels in groundwater at 14 McCaffrey Street in the Village of Hoosick Falls. The Village and New York State Department of Health (NYSDOH) have also identified PFOA at concentrations exceeding applicable standards, criteria, and guidance values in the Village's public water supply system and in several non-m unicipal wells in the Town of Hoosick. Actions are needed to reduce human exposures to PFOA in these water supplies and perhaps others, as well sampling continues. NYSDOH has also identified lower concentrations of PFOA in private wells and other public water supplies in the Town. Overall, actions are needed to identify the source(s) of this contamination, to define the nature and extent of contamination in groundwater and other environmental media, and to evaluate and address associated human exposures. To ensure the health and safety of residents in Hoosick Falls, the state Department of Health has begun offering free blood testing for community members who wish to be tested. That process will begin tomorrow, Saturday, Feb. 12. At the Governor’s direction, DOH Commissioner Dr. Howard Zucker and DEC Acting Commissioner Basil Seggos will be onsite to answer questions from residents. For more information on this testing service, and to make an appointment for a blood test, residents should call (800) 801-8092, email BEOE@health.ny.gov, or visit the DOH website here. February 12, 2016: Testing by the New York State Department of Health and the Village of Hoosick Falls, New York, has revealed that groundwater and drinking water in the Village of Hoosick Falls is contaminated with perfluorooctanoic acid (PFOA). The U.S. Environmental Protection Agency (EPA) has been gathering information regarding the Hoosick Falls PFOA contamination in conjunction with the Village of Hoosick Falls, the county health department and the New York State Department of Health (DOH) and Department of Environmental Conservation (DEC). Why is the EPA Sampling the Ballfields? As part of its work to address PFOA in the Village of Hoosick Falls, the EPA is looking into two potential issues. The Agency will look at whether past releases of PFOA into the air from local facilities may have contaminated the soil on the village’s ballfields based on their proximity to a potential source. The EPA will also sample to determine if this area was used for disposal in the past. To make its assessment of the ballfields, the EPA will take samples at varying depths ranging from the surface of the soil down to the water table, which is reported to be about 18 feet below the surface. The samples will be analyzed for PFOA and related chemicals, as well as for a suite of pollutants including volatile and semi-volatile organic compounds, polychlorinated biphenyls (PCBs) and metals. The sampling results will be compared to values that EPA has established to determine if cleanup work is necessary. 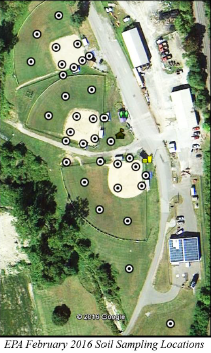 In Which Areas of the Ballfields Will Soil Be Sampled? The EPA will be sampling multiple locations in and around the ballfields where people, especially children, are most likely to be exposed to the soil. This includes seven locations on each ballfield, the dugouts, bleachers, spectator areas, batting cages and pavilion area, and the two open fields along Waterworks Road near the water treatment plant. The upper foot of soil will be sampled at two intervals: the first three inches, and from three inches to a foot below the surface. Several deeper soil samples going down to the water table will also be collected. The laboratory results are expected to come back in late March or early April 2016. The results will be announced and will be available to the public prior to the start of the pre-season for baseball and softball. The EPA plans to hold a public session to explain the results and answer any questions. If PFOA, hazardous substances, or other contaminants are present in the soil at the ballfields, the EPA will analyze the results and determine whether any cleanup work is necessary to protect the people who use the ballfields. Download the PDF version of this news item. February 11, 2016: The New York State Department of Environmental Conservation sent Saint-Gobain and Honeywell International a letter identifying them as parties responsible for PFOA contamination in the Village and demanding the companies implement and pay for an investigation and remediation of the contaminated sites. NYSDEC Acting Commissioner Basil Seggos said, "We will hold all companies responsible for groundwater contamination and make sure they pay all costs associated with the investigation and remediation of the source of the problem as well as assuring a usable drinking water source." The New York State Department of Environmental Conservation (DEC) today identified Saint-Gobain Performance Plastics and Honeywell International as parties responsible for Perfluorooctanoic acid (PFOA) contamination in the Village of Hoosick Falls area as a result of the agency's preliminary investigation. DEC's investigation has identified groundwater contamination at the McCaffrey Street site where Saint-Gobain Performance Plastics and Honeywell International used PFOA for decades. Using state Superfund authority, DEC will hold these and possibly other companies liable for the full investigation and cleanup of PFOA contamination. "First and foremost, under Governor Cuomo's direction, our priority is to provide safe and clean drinking water to the people of Hoosick Falls," DEC Acting Commissioner Basil Seggos said. "We will hold all companies responsible for groundwater contamination and make sure they pay all costs associated with the investigation and remediation of the source of the problem as well as assuring a usable drinking water source." DEC sent a letter to Saint-Gobain and Honeywell (PDF, 2.1 MB) demanding that these companies enter into binding consent orders to implement and finance the investigation and remediation of the contaminated sites. The demand letter is the first step in the process to develop a consent order under which these companies, and others that may be identified in the course of the investigation, would be held liable to pay for the investigation and remediation of all PFOA contamination and protection of safe, clean drinking water for Hoosick Falls. In the event Saint-Gobain, Honeywell and any other potentially responsible parties refuse to voluntarily cleanup under such an order, New York State will use its full authority under the law to pursue all available legal remedies against the companies. This action is the latest development in DEC's investigation, which commenced four weeks ago, and stems from DEC's issuance of an emergency regulation classifying PFOA as a hazardous substance and classification of the Saint-Gobain facility as a state Superfund site. These classifications unlocked state Superfund resources to start the investigation into the sources of contamination and allow the state to pursue potentially responsible parties. Today's letter begins the process for the state to recoup any costs the state incurs, if the responsible parties refuse to pay the costs of the investigation and remediation. Under the state Superfund law, polluters that contaminate the environment with hazardous substances can be held responsible for remediation. DEC will continue its investigation to determine the extent of contamination in order to ensure the contamination in the Hoosick Falls area is addressed and residents have a reliable source of clean and potable water. February 1, 2016: Today the Village received notice from NYS DOH informing us that they plan to have a regular presence in the Village beginning tonight. They plan to set up information sessions at the Armory starting today from 5-8pm and they will be available to answer questions and disburse information about the water status. People will be able to ask questions concerning blood testing, water testing, etc. This is a directive from the meeting with the Governor last week. Going forward, the DOH staff will be available each week on Tuesday and Thursdays from 2:00pm to 8:00pm and on Saturdays from 10:00am to 2:00pm until further notice. They will also be working on coordinating information from the various regulatory agencies involved. State hotline (1-800-801-8092) established to help public stay informed. Governor Andrew M. Cuomo today announced a series of immediate actions by New York State to address contamination in the Village of Hoosick Falls’ water supply and at the Saint-Gobain Performance Plastics Site. These announcements follow today’s meeting between the Governor and senior state and local officials. Issue Emergency Regulation to Classify PFOA as Hazardous Substance: The state Department of Environmental Conservation today issued an emergency regulation to classify Perfluorooctanoic acid (PFOA), the contaminant found in the Village’s water supply, as a hazardous substance. This provides DEC with the legal authority to pursue State Superfund designation and cleanup of the site using State Superfund resources. Classify Saint-Gobain Facility as a State Superfund Site to Unlock State Resources to Address Contamination: Further, the state announced it will classify the Saint-Gobain Performance Plastics Corporation McCaffrey Street Plant and other possible sources of contamination that may be identified in Hoosick Falls as State Superfund sites to unlock state funding resources under the State Superfund Program to address the contamination in the community. DEC has already initiated its investigation and inspected the Saint-Gobain property. If in the course of its continuing investigation DEC finds any additional sources of PFOA contamination, they will also be listed. The Superfund Class 2 designation will allow the state to use State Superfund resources to investigate and clean up PFOA contamination much more quickly than waiting for a federal Superfund designation. In addition, the state will be able to seek cost recovery for the investigation and cleanup activities. DEC will collaborate closely with EPA in the investigation of PFOA in groundwater, soil and other media in Hoosick Falls to determine appropriate cleanup activities. Conduct Health Risk Analysis to Establish PFOA Drinking Water Guidance Level: To address the water supply contamination, the state Department of Health will conduct a risk analysis, examining the latest national research, to establish a drinking water guidance level for PFOA. Retest Private Wells in the Village of Hoosick Falls: In addition, the state Department of Health will retest 24 private wells in the vicinity of the Saint-Gobain facility. Immediately Install Filtration Systems at School and Other Community Gathering Places: Out of an abundance of caution, the state committed to installing water filtration systems at the local school, public health facilities and other community gathering places. Blood Testing of Community Members to Begin in Mid-February: Beginning in mid-February, DOH will begin blood testing for community members for those who wish to be tested. Establish State Hotline for Public to Stay Informed: Residents can contact 1-800-801-8092 for more information. Further, once PFOA contamination is addressed, the state committed to work with the community and banks to safeguard property values. Today’s actions build upon DEC and DOH’s initiatives announced earlier this month to address the PFOA contamination to protect public health and the environment. The state urged EPA to take vigorous action on the federal level to regulate PFOA and to quickly add the Hoosick Falls site to the Superfund National Priorities List. The state, Saint-Gobain and the Village are collaboratively working on an agreement to install water treatment systems to remove hazardous chemicals from the Village’s water supply. In addition, DOH is undertaking a cancer registry study to investigate the incidence of cancer among Village residents and biomonitoring studies. Further DOH is offering PFOA biomonitoring to measure the level of PFOA in Village residents. PFOA was detected in the Village’s public drinking water in 2014. Since then, DOH has worked closely with the Village to provide technical advice and assistance for water sampling and to evaluate water treatment options to eliminate health risks. Because the levels of PFOA in public water were higher than the EPA health advisory level, DOH determined that people should reduce their exposure by avoiding the use of tap water for drinking and cooking. In addition, DOH continues to monitor private wells and will have more results very soon. Although the use of PFOA is being phased out, it is still used to make household and commercial products that resist heat, and repel oil, stains, grease, and water. This includes nonstick cookware, surface coatings for stain-resistant carpets and fabric, and paper and cardboard food packaging. Studies of people have associated exposure to PFOA with an increased risk for several health effects. This includes associations with effects on the liver, immune system, thyroid gland, cholesterol levels, blood pressure during pregnancy, and kidney and testicular cancer. January 7, 2016: The Village in cooperation with the NYSDOH, Saint-Gobain, and C.T. Male have been exploring installing a temporary short-term GAC filtering system at the municipal water plant. This system can be installed in a matter of weeks, and will remain in use while the permanent GAC filtering is being built. There is only one of the required temporary GAC systems available at this time, so the parties involved in designing and approving the system have been working diligently to insure that we did not lose this opportunity to another entity that my have a similar filtering need. The DOH has reviewed and approved the plans, and the board has voted to order the temporary GAC filter to be installed immediately. Further details will be shared as the project progresses. January 12, 2016: The Village has developed a separate webpage in its ongoing effort to keep the community informed regarding the discovery of Perfluorooctanoic Acid (PFOA) in the municipal water system. Much information has been shared since concerns were first raised in August 2014. The Village is committed to keeping an open line of communication with the community as the investigation continues. To that end, the Village has populated a new webpage with relevant documents, resources, upcoming meeting details, and other relevant information. It will be continually updated as the Village continues to address this important issue. The website currently has sections for: FAQ's; News; Board action timeline; Documents; Resources; and Events. The pages will be further developed as materials and information are gathered. Village of Hoosick Falls Municipal Water Website.